In a saucepan, mix soy sauce, ginger, brown sugar, honey, vinegar, garlic salt and 1 cup water together. Heat on medium high. In a separate container mix cornstarch and cold water together. Slowly add mixture to saucepan, whisking continuously. The sauce should start to thicken. YOU WONT NEED ALL THE CORNSTARCH & WATER MIXTURE OR IT WILL GET TOO THICK! If you add to much, add a little water to water down. 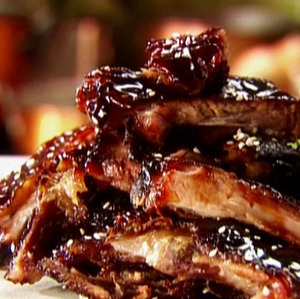 Add the ribs to the slow cooker and pour the sauce over the ribs. Cook on low for 8 hours. Serve with white rice and corn! :) Yum!